Beyond School Bells – Page 2 – Learning doesnt end when the school day does. Research shows that math and reading skills deteriorate for all youth during the summer months. This “summer slide” is more pronounced for low income youth, who may lack access to informal learning experiences available during summer. The summer learning opportunity gap is cumulative, with the predictable annual setbacks in student learning making it even harder for low income youth to keep pace with their classmates as they move from elementary to middle school. By the time youth reach the 6th grade, research shows that there is an average learning opportunity gap of 1,080 hours between low income youth and upper and middle class youth, due solely from different summer learning experiences. Access to high quality summer learning opportunities can help prevent the summer slide. Youth from Nebraska’s low-income families need these important learning opportunities – school-based programs, camps, center or library based programs – which vary from community to community. While many programs across the state already provide important summer programs, we know more Nebraska youth need access to learning opportunities during these critical months. The National Summer Learning Association serves as a clearing house for information about Summer Learning programs. We encourage you to visit this site and talk to other leaders in your community about developing or expanding high quality summer learning experiences – especially for youth from our most challenging educational environments. Afterschool programs across Nebraska are providing youth with hands on, engaging Science, Technology, Engineering and Math (STEM) programming that allows them to explore their passions. Youth need to tell these inspiring stories. And now they have the opportunity to do so. Youth in afterschool and summer learning programs are invited to create a short (three-minute) video telling how they are becoming the next generation of STEM professionals through engaging, inspiring, hands-on learning taking place in afterschool and summer programs across Nebraska. Prizes: Six winning videos (three school-year / three summer) will receive recognition at a national STEM Summit and $1,000. Visit www.stemvideocompetition.org for more information about the competition and for video guidelines. This program is made possible by our national partners the C.S. Mott Foundation and Noyce Foundations. In April, the Nebraska Legislature gave unanimous first round approval to Legislative Bill 519 which for the first time would define expanded learning opportunity programs (p. 35-38) in Nebraska and authorize a grant program to fund future activities in this area. This proposed legislation, which is part of a larger package of programs that use the education funds generated by the sale of lottery tickets, would also provide the first ever state level funding to support afterschool and summer programs. While there are two more votes, and a Governor’s signature, remaining before this bill becomes law (and funding wouldn’t be available until 2016), the prospects for passage look good, especially after it made it out of the first round without any opposing votes. We encourage you to reach out to your legislator to show your support for this bill and we will update you on the progress of LB 519 as it makes its way through the Legislature. On April 14- 15th, Beyond School Bells hosted a national Out of School Time (OST) STEM systems building institute in Omaha. 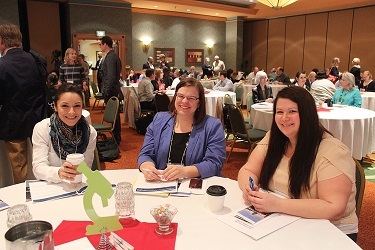 The 160 attendees were equally divided between teams from statewide afterschool networks and their partners from 22 states and a large Nebraska delegation, which included teams from eight Nebraska communities, state level partners and business and non-profit leaders. Lt. 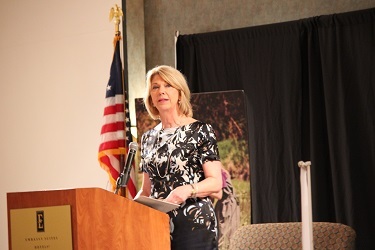 Governor Foley welcomed the group to Nebraska and Mayor Stothert extended the welcome to Omaha, where the innovative OST STEM partnerships facilitated by Collective for Youth provided a backdrop for the day and a half schedule of presentations, site visits and workshops. The agenda also included a film festival featuring afterschool videos from across the country, including contributions from Nebraska. We envision the Institute serving to promote efforts to develop sustainable afterschool and summer STEM programs in communities across Nebraska and supporting efforts to raise the profile of this important work across the country. This conference was made possible through support from our national partners, the C.S. Mott Foundation and Noyce Foundation, Omaha-based The Sherwood Foundation, as well as local partners at UN Extension, NE Loves PS and NET. On March 18th, 2015, Governor Ricketts signed a proclamation dedicating March 23rd – 27th STEM (Science, Technology, Engineering and Math) month in Nebraska’s afterschool and summer programs. This proclamation helps shine a spotlight on the important work that is being done in ELO programs across the state to provide Nebraska youth opportunities for hands-on, engaging STEM learning – the kind of learning that research shows is crucial for their continued interest in STEM careers. We encourage you to use the opportunity that this proclamation provides to shine a spotlight on your own afterschool STEM activities. What does Practice say about ELO Quality? On February 27th, 2015, Beyond School Bells hosted our second ELO Quality breakfast at our office in Lincoln. This meeting featured a panel of ELO Leaders from Lincoln and Omaha (Lea Ann Johnson-Lincoln CLC Director and Megan Addison-Collective for Youth Executive Director) and Dr. Teresa Wanser (ESU #18, Lincoln Public Schools) and Dr. Anne Hermann (Omaha Data Collaborative, United Way of the Midlands). The panelists discussed how they have developed data systems to collect information about the impact of their program on participating youth. They also shared about the ELO field’s data collection limitations and future data system needs. This breakfast built on a conversation we started in December at a similar breakfast which explored What does the Research say about ELO quality. On February 24th, Senator Kate Bolz of Lincoln introduced LB 379 which would expand funding available to support Nebraska’s Expanded Learning Opportunity programs. Importantly it would, for the first time in Nebraska law, define ELOs and create a structure for a future grant program to both sustain existing high quality ELO programs and expand programs in underserved, high need rural and urban schools across the state. Formal introduction of this bill at a hearing of the Education Committee is a first step in a long process that will unfold over the coming months. We will keep you posted as this discussion unfolds during the legislative session. Thanks to those of you who wrote letters of support or testified for this important legislation.